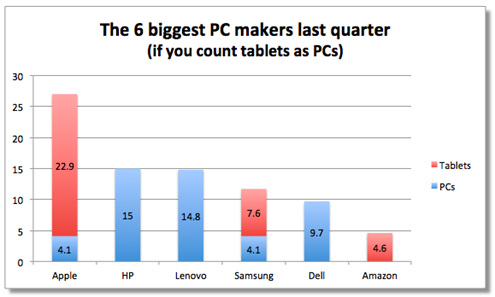 A report issued this week by the Canalys market research firm shows Apple surprisingly atop the list of the world’s biggest PC makers in Q4 of 2012. The clear reason for Apple’s position is that Canalys counts tablets as computers – unlike other major research firms like IDC and Forrester. — Around 1 out of every 6 computers shipped last quarter was an iPad! — None of the leading computer manufacturers shipped as many computers total as Apple sold iPads. HP’s number is 15 million – well behind the iPad on its own at 22.9 million. Given the iPad’s massive adoption rate in the Fortune 500, its use for a huge array of business and productivity purposes, and its amazing versatility I think it makes perfect sense to count it as a computer. It’s incredible to think that the iPad itself, and the sort of tablet it is, did not even exist just a little over 3 years ago.